Yes the heads are interchangeable. You can put a 20v head on just about any vw 4 cylinder bottom. Only difference is older blocks are missing the 3 main oil returns on the back of the head. In your case you have nothing to worry about it's a direct swap. Stock end gap is normally 0.00015" I open that up to0.00035". I doubt there's much more science in those compression dropping gaskets than getting pair of normal gaskets, drilling out rivets that holds layers together and combining them to thickness you need. Kinda ghetto way, but i has been done and working. Yeah, ARG/ADR pistons aint forged, I got official answer back from Mahle. Say I get the turbo block, what would I need to know to switch pistons over? Keep in mind I got no engine stand or lift, so I would have to do in the car, (maybe I can rig up an engine stand for to take apart the other motor) , would I need to rehone the wall, etc. or just get new piston rings and bearings for rods or just rings and drop them in like it right now ? Or should I clean up the wall at the top with 2000 grit sandpaper or something like that. I havent really touched any lower block so far, but its not rocket science so I'm willing to try. edit: oh and will the stock ECU compensate for this change with the rest of the motor being stock, cause I dont have the bank to buy all the turbo parts necessary right now. Why not just swap bottoms completely? Avoid pulling it apart for now. No engine lift , etc , swapping over would be easier IMO from under the car. Another thing .. AEB is a large port head, my current intake manifold is small port , how is that gonna work ?, small port gasket or big port headgasket ? Feels like there's no easy solution here. Just a slightly less complicated one. Looking forward to reading how you pulled it off, Blazius. So currently I was in talks with a dude for an AEB motor, but I dont know whats the end verdict, I want a motor asap, and the dude wants like 20 bucks infront as warranty that I am not scamming him(with shipping , not picking up , sendin it back ) ,but there are no banks near me and I dont have internet banking enabled atm, I am not really feeling it to be honest, this motor is 240 usd shipped. I also started talking with another one that is the same engine code (ARG) for 170 usd , dunno about shipping yet, with apparently 180kkm , they seem more serious. The issue is here that AEB is a large port head , and I got small port intake , 1st of all I dont know how would that work, and second as I said it seems dodgy to me tbh, now if its actually legit and I buy the other one (ARG) then I miss out on free turbo pistons, and if I want to run higher psi eventually either I get a thicker HG or get turbo pistons from somewhere. Ahh, I think I'll say to the turbo one, if he wants to sell it Ill pay all the total when it comes with courier no paying in advance or bye, and if he accepts , good ( hopefully the motor is working LOL) and if he doesnt I'll get the normal one. Use large port gasket and if you have access to grinding tools, port the manifold to match the gasket. Theoretically another way to drop compression ratio is to enlarge combustion chamber in the head. There is some metal to grind off. I'll get a piece of plexiglass and try to play with enlarging the chamber and measuring its volume on one of spare heads I have. Yea , that is what I am going to do but no sanding tools really, so hand sand is gonna be fun. And yeah I seen "porting" the combustion chamber , but doesn't that introduce other issues, there is a vid on youtube of people doing it. For now I am waiting until monday to see whatsup, also if I get that engine it comes with some bits and pieces, actually I can upload a pic. 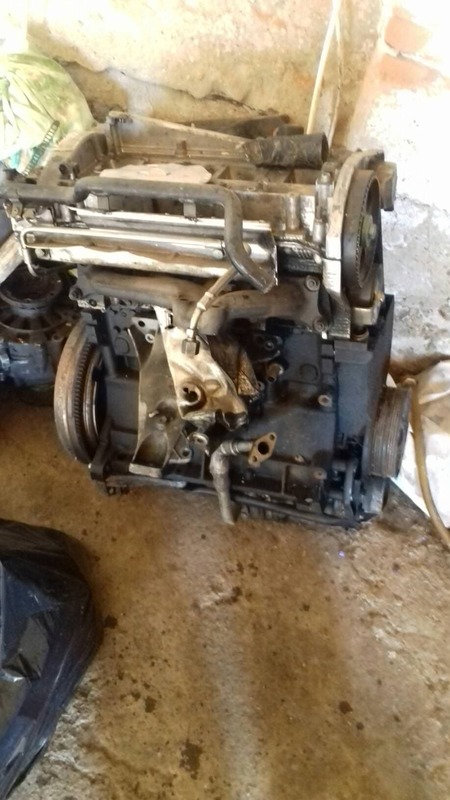 Yeah, that is what I'm gonna do , but I am going to dissassemble the head before installing, to soak it in diesel , cause its prolly gonna be sludged af , and I am going to do the same with the block, that is okay right or is it enough to get the lifters out and leave the valves in ? So , just got myself a valve spring compressor , a proper headbolt tool aswell , 2 little things cost a bazillion Now about the engine, gonna call the dude soonTM and see what he says.